First of all, shut down your Thinkpad T43. Disconnect the AC adapter and remove the battery. And Remove the keyboard. 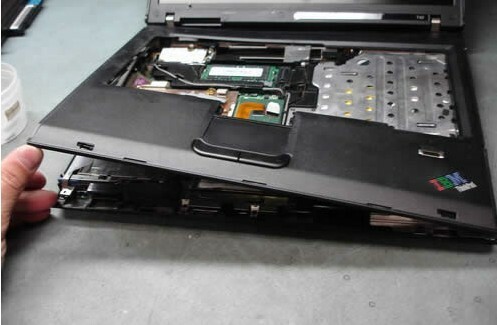 You can refer to our other instruction How to Remove the Lenovo Thinkpad T43 keyboard. 1. 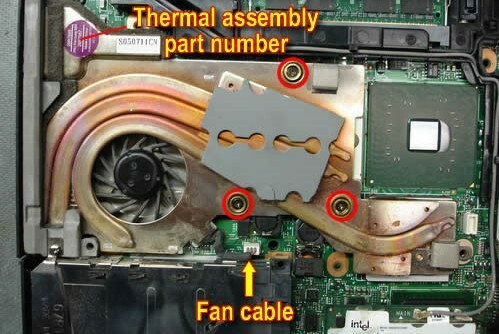 The Thinkpad T43 cooling fan assembly is hidden under the palm rest and cannot be removed until the palm rest is removed. 2. Now we are going to remove the palm rest. 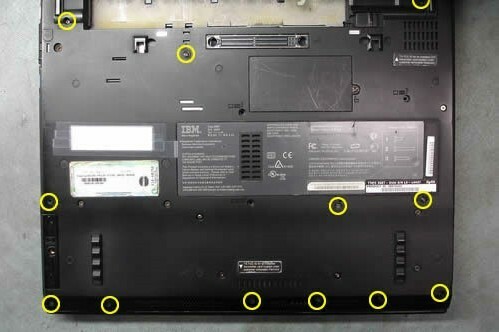 Remove all marked screws from the bottom of the laptop. 3. 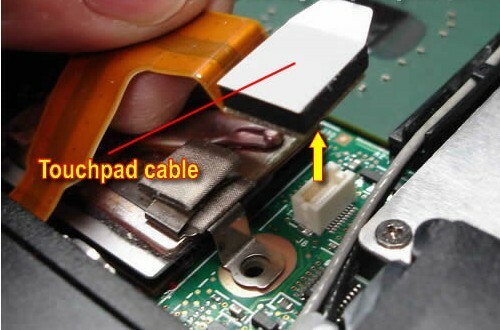 Disconnect the touchpad cable from the Thinkpad T43 motherboard. 4. Start separating the palm rest assembly from the laptop base. Remove the palm rest assembly. 5. Remove three screws securing the Thinkpad T43 cooling fan assembly. 6. 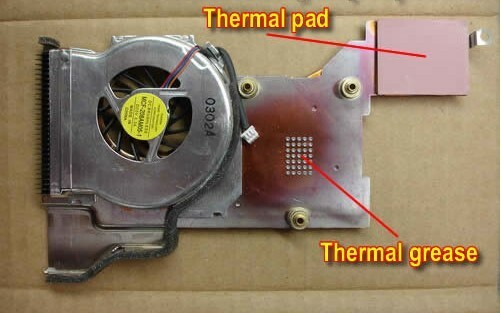 Lift up the right side of the Thinkpad T43 cooling fan assembly, then remove the cooling fan assembly. 7. 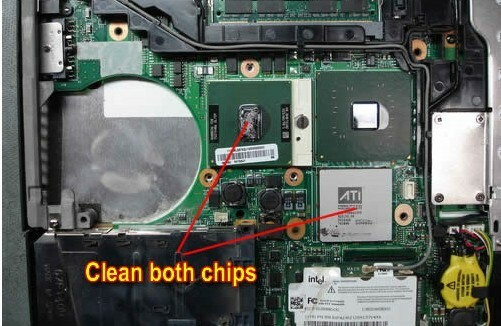 Clean up the CPU and GPU chips with an alcohol swab. 8. 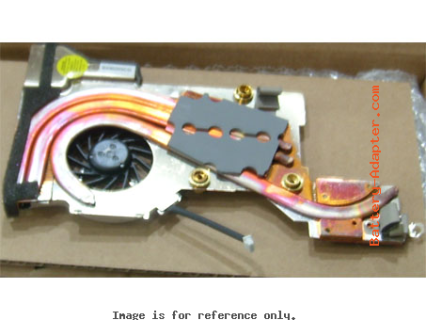 A new cooling fan assembly should come with thermal grease pre-applied on the heat sink. Also, it comes with thermal pad for the GPU. 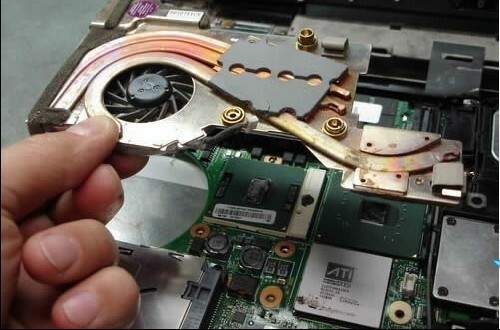 Reverse the procedure to install your new Thinkpad T43 CPU fan.